I love a good short story. As an agent for the Child Protective Services, John McDonnell has seen his share of evil people and evil acts. But nothing has prepared him to face what's behind the door of his most recent assignment. "He don't like you playing children's games," says the little girl who opened the door. A voice inside him screams, Get out of here! John McDonnell has been called to investigate a report for Child Protective Services. He never knows what he's walking into with each new case. Nothing could prepare him for his latest assignment. 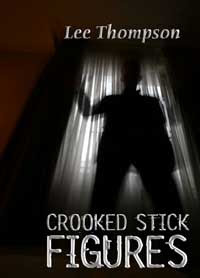 Crooked Stick Figures is an excellent story full of atmosphere and suspense. Thompson's storytelling is vivid and well paced. This story is the first work I have read by Thompson, but his story Before Leonora Wakes is quickly approaching the top of the to be read pile. In fact, I think it just jumped up a spot or three. I got Crooked Stick Figures free through Darkside Digital. If you like a creepy tale, take a moment to check it out! Lee - Thank you for writing great stuff. Whoa. That is intense! Thanks for the review.